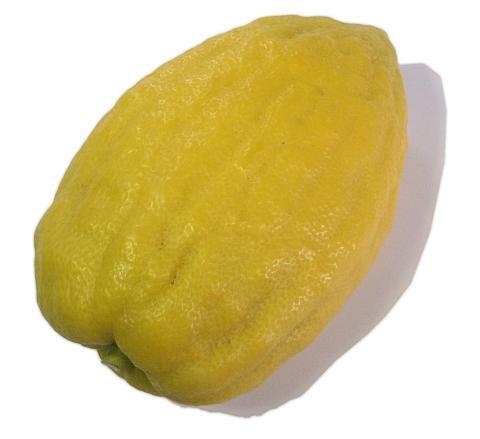 General Information: The etrog is a medium-sized citrus fruit, with a color, scent and taste similar to a lemon. It is also known in English as the citron, though there is apparently more than one variety of citron. This variety is identified in scientific literature as the etrog citron. The etrog is used in the waving rituals of the festival of Sukkot, where the etrog is said to represent the heart (because of its shape), and also said to represent the ideal kind of Jews, who have both knowledge of Torah and good deeds (because it has both a pleasant scent and a pleasant taste). One study suggests that the etrog, not the apple, was the forbidden fruit in the Garden of Eden. Why, then, does the Western world think that the fruit was the apple? Perhaps because the ancient Greeks called this fruit the Persian apple, Median apple or golden apple. A typical etrog fruit is oblong shaped, four to six inches long and has a bumpy rind. The Yemenite variety of etrog is larger, but looks quite similar. It is almost 5 inches long. At its widest point, it is 2� inches wide. Some etrogs have a narrowing in the center, like a waist, that is somewhat more green. These are commonly referred to as "belted" etrogs. Belted etrogs are valid for the mitzvah of the waving; in fact, some people prefer them.